A rank outsider has slimed its way to success in London's first professional snail race. Only Gazza and Shuey managed to cross the finish line out of 10 competitors, after racing commentator John McCririck set them on their way with the words "Ready, Steady, Slow". In the last few minutes 100-1 Shuey beat 33-1 Gazza by a short antennae. Mr McCririck said it was one of the most exciting races he had commentated on. "The bookies will be celebrating in the City tonight," he said. "Who'd have thought that two rank outsiders would go antennae to antennae in this race? "Of course it's always difficult to study the form with snails because they hide inside their shells." 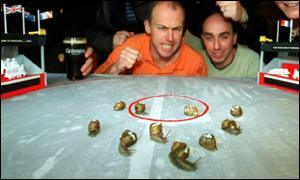 The Guinness Gastropod Championship, held in the O'Conor Don pub in central London, also featured an attempt to break the world 13-inch sprint record - currently held by Archie at two minutes 20 seconds. Flitcham farmer Neil Riseborough, president of the British Snail Racing Association, had been training his 40 snails for the last two weeks. Mr Riseborough, 40, has been involved with the sport for the past 10 years. Before the challenge he said: "I'm very excited about this. They have been on iceberg lettuce .. but I have switched them to high-protein British-grown lollo rosso in the last few days to give them that extra bit of zip." But it turned out to be a disappointing day for Mr Riseborough, whose fastest snail came in at six minutes 26 seconds. Tim Footman, editor of the Guinness Book of Records, judged the record attempt. "Obviously it's a disappointing result, maybe it's the early morning, maybe it's the air," he said. "Snail racing has been slow if not positively sluggish to get off the mark"